Have the similar trouble? Don’t worry. This article aims to give you an easy way to fix the issue. Since MKV is not an ideal format for streaming via NAS, and few media server and media player can do a particularly good job on HD MKV videos, a quick workaround is to convert MKV to a more compatible format like MP4, AVI before transferring to NAS. In this case, aPubsoft HD Video Converter comes out for you. It is capable of converting MKV to MP4, AVI, MOV for NAS streaming with no quality loss. And what we’ve tested out is that MP4 would be one best target format for it is fully compatible with nearly all media server and media devices including iPad, iPhone, PS 4/3, Apple TV, etc. Far more than a video conversion program, it provides some simple video editing functions, letting you touch up and personalize your video instantly to get the part and effect you want. If you are running on Mac OS X, turn to aPubsoft HD Video Converter for Mac. How to convert MKV for NAS streaming? Step 1. 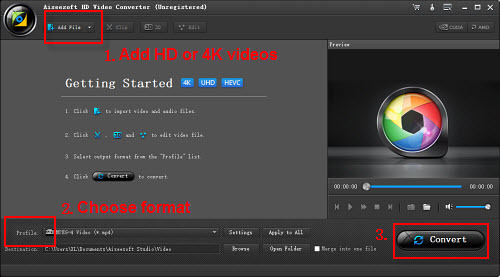 Install and launch aPubsoft HD Video Converter as the best MKV to NAS Converter. Add the MKV videos which you want to convert by directly dragging them to the main window of this program. Another way to import files can be done with clicking the “Add File” button. It supports batch conversion. Step 2. Click “Profile” bar and choose your desired format. To put MKV on NAS for easier streaming, we recommend MP4 as the output format. And click “Settings” bar, you can adjust the level of compression to suit the quality you want. Step 3. Click the “Convert” button to convert MKV to MP4 for NAS streaming on Windows with original video and audio quality. After the MKV to MP4 conversion completed, click “Open Folder” button to get the output .mp4 videos. Then it would be easy for you to share it off the NAS effortlessly. Make sure the wireless network connection is accessible among the NAS and PS4/PS3, HD TV or other media players.